Facebook has been dealing with suspicious behavior apps (phishing), since it launched its Facebook platform for developers in 2007. As an open source app development tool, anyone can create an app, including cybercriminals who just want to steal your information. With cybercrime raising, Facebook users should pay more attention to what they click on. Most of these apps are designed to make money for their creator, and this money is actually made off of you. Sophos reports that almost 60,000 people have clicked on this given scam promising you to see who has viewed your profile. The app automatically posts a comment to the users timeline, with the message “OMG OMG OMG… I can’t believe this actually works! 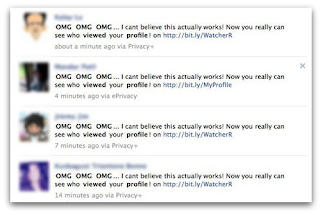 Now you really can see who viewed your profile ! Link here”. The app does not actually allow users to see profile views but instead leads them – as well as anyone who clicks on the link posted to their wall – to a phishing scam designed to steal your personal data. Another popular Facebook phishing app is the Facebook colors one which can appear as “Facebook Pink” or “Facebook Black”… the latter being installed on a computer with an antivirus including a link scanner. Many Facebook scam and phishing apps offer promising things that seem surprising and hard to resist. Be aware of such offers including profile personalization, viewing people who spend time on your profile, and games that can instead steal your information or spam your friends with malware and viruses, and post items on your wall without your permission. Most Facebook apps can be used without a problem. However, there are a few basic signs you can look at to identify scam and phishing apps : automatic tagging, commenting and sharing links, promised features that you haven’t already seen in use, vanishing apps showing no results after being installed. If the app you have installed includes some of these signs, you will want to remove it immediately. Facebook now allows you to completely control which apps can access to your profile, by clicking the small gear in the upper lefthand corner. Then you should click ‘settings’ and then ‘apps’ from the app page. You can remove anything in the apps that you are not familiar with or did not install. If the app has in fact installed to your browser, you can maybe be able to uninstall it by going into tools and then extensions or add-ons depending on which browser you are using. Studies show that identity theft is once again rising and shall soon become the most popular scam. Phishing emails and apps are the easiest way to steal identity, e.g. name, phone number, credit card information… In 2012, 12.6 million Americans were the victims of identity theft, a number that is nearly as high as the 2009 record of 13.9 million. So be much aware on what you click on. The best way to protect your personal information from malware & spam is to access to a VPN service. Le VPN encrypts your Internet connection with a top secret level system which protects you against hackers and ears trying to listen or obtain sensitive information about you. Your computer and mobile device will be hidden behind the numerous VPN servers: when you are connected to the VPN, no one can access your connection without passing through the protected VPN servers. Le VPN also reduces your online movements by replacing your routing information: your IP address will be replaced by an anonymous IP address. Our secure DNS servers keep secret queries you make, so that no one can take a look at your browsing history.